If you’re interested in being a security guard, becoming a private security agent can be an excellent way to increase your earning potential and provide for more interesting and challenging security situations. Private security agents often provide security for high net worth individuals and even famous celebrities. A private security agent gets paid significantly more than an ordinary security guard, but the career path usually starts on the same trajectory. Most private security agents will have backgrounds as security guards or law enforcement personnel. The easiest way to become a private security agent is usually to have a background as either a police officer or military soldier, but this isn’t always required. Those that have degrees in areas of law enforcement such as criminal justice will often be preferred by private security companies. A private security agent is usually hired not directly by the person being protected but instead by a private security agency. This means that there is a wide breadth of different requirements that a security agent might encounter. However, in general it is preferred that a private security agent have some form of degree in law enforcement or criminal justice. These degrees can be obtained both at on-campus schools as well as online schools, and the degree can be an important stepping stone for those interested in the private security industry. The private security industry can be highly competitive, and those without the proper employment background may need it to get their foot in the door. 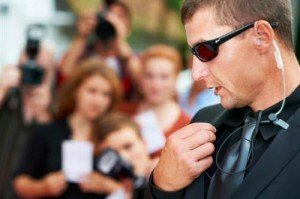 Becoming a private security agent can be a little difficult for those that are not already in the industry. As mentioned, those that have prior experience in similar fields are usually the first pick for security companies. Many security companies will only concern themselves with those that have law enforcement or military experience, but someone who is truly interested in the private security field can potentially work their way up by working in the security industry as a security guard. Once a person has enough experience or a significant amount of education under their belt they can begin applying with private security companies. According to the Bureau of Labor Statistics, most security guards make a median of $27,240. However, security guards will be on the low end of the scale while private security agents will make larger amounts of money. Many private security companies are as rigorous about their screening as law enforcement agencies, and they will require background checks as well as drug tests. If an applicant can get through these strict screening procedures, they may be hired as a private security agent. The goal of a private security agent is usually to eventually command their own team and become a manager of security. To do this, a security agent will usually need a degree. They will also need to separate themselves from other agents by showing leadership, competency and dedication. Private security agents need to always remain confidential about the things that they experience and see throughout their work, and they need to be willing to take risks in order to keep their client safe. A private security position isn’t the safest job that one can have, but it is still statistically safer than most other jobs in law enforcement. It should also be noted that some states, such as Georgia, require certain types of individual security agent to be licensed as well as the companies. If you’re interested in being a private security agent but would prefer to work on your own, you might consider becoming a private investigator. Other similar jobs include being a security guard, especially for those that wish to become a private security agent in the future, and being a special agent with the government. Many private security agents were also once either in the military or in the police force, and those who are looking for excitement and challenge may consider becoming a police detective.